We fight the battle with deer hunters over what is good to great deer ground every year. 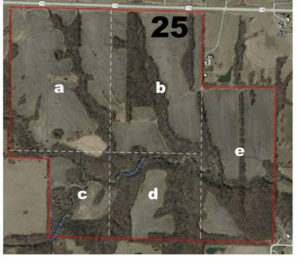 Differences are largely we have seen what has been taken off various spots compared to many deer hunters who believe aerials are predominate spot selection tools. The aerials below are all top productive trophy land. 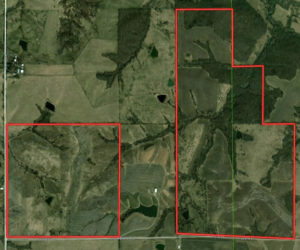 The red boundary lines are the limits of our lease. Wood patches gain most attention. In case of this spot it is not trees where trophies have been seen/harvested. 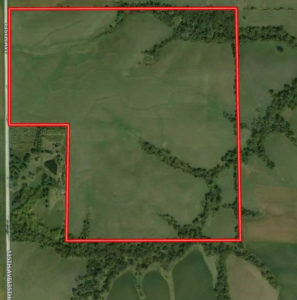 It is areas out of direct line of sight of human activity from roads, pastures, barn yards, which hold deer. A spot any deer hunter would ignore if aerials were his only form of scouting. What is not apparent is the open ground is all native grass. Five to 6 foot tall grass. If not understanding value of native grass has to deer hunting then hunting this spot would be wasted effort. 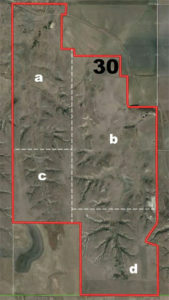 Typical open lands hunting in a very competitive Kansas deer management unit. Those with experience in open country would hunt this land hardest. What most deer hunters from many parts of the USA would say is a very good lease. A strong mixture of cover and row (grain) crop. Year round cover and food mixed over a good sized area. Plus year round water on several ponds and a creek. Now the challenge is which spot to hunt Our system allows hunters to hunt more than one spot per day every day. It is by covering ground on such land a trophy is more likely to be encountered than by picking one spot and convincing yourself that is the right spot. We repeat it many times that more successful hunters over many years hunt 3 to 5 spots each trip. Any chance to view wildlife and habitat pictures is worth its effort. Getting as acquainted as possible with a region not before scouted speeds the entire process. Viewing pictures provided by hunter/members all the more valued due to the variety they will present. The trees in the back ground are Osage Orange or locally called Hedge Apple. Few hedge trees offer stand placement without much cutting. This is where a 24 inch hand saw is worth to carry. Very common trees to find along fence lines. 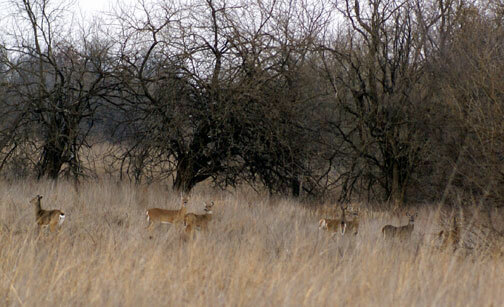 The caption along with this picture is these deer were on a MAHA lease making their way to a crop field.